The 2nd namaz-e-janaza of Poet Al Mahmud was held at Baitul Mukarram National Mosque in the capital on Saturday. 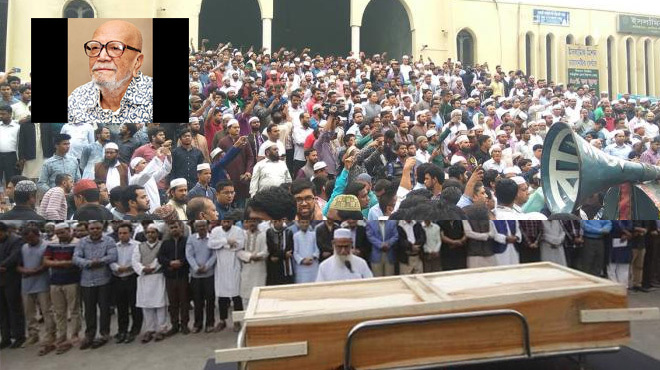 Earlier, the first janaza of Al Mahmud was held in National Press Club at 12:45 in Dhaka. The Ekushey Padak winning poet passed away on February 15. He had been suffering from several old age complications. On Sunday his body will be taken to his village home at Mourail in Brahmanbaria district for burial. Before that, the body of poet Al Mahmud will be taken to his residence at Dhaka's Moghbazar in city.